Magnus Paajarvi has shown flashes of his potential since being obtained for David Perron last offseason. 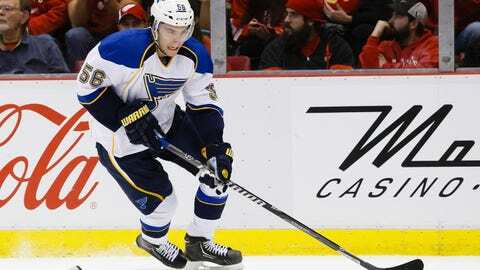 ST. LOUIS — Magnus Paajarvi remains a bit of a mystery during his first season with the St. Louis Blues, but the speedy Swedish winger is beginning to find his footing with his new team. "I’ve had a different role this year compared to my other three years in Edmonton," Paajarvi says. "Obviously, I realize what kind of team I’m in. I realize how good this team is and I’m willing to do and willing to take whatever I get and hopefully get better. I want to play as much as I can. It’s been different, but it’s been a lot of fun." Paajarvi, 22, was acquired by St. Louis from Edmonton, along with a second-round pick in the 2014 draft, for David Perron last offseason. The trade allowed the Blues to shed some salary they could use to re-sign other players. Perron is making $3.5 million this season and is set to make $8.75 million over the next two years, according to CapGeek.com, while Paajarvi is making $1 million this season and $1.4 million next year. 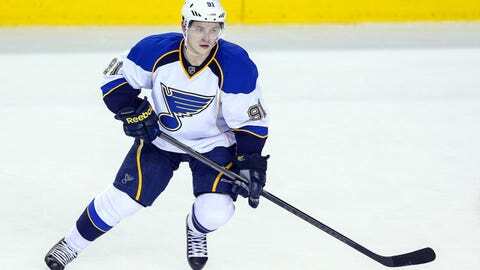 Additionally, the Blues got a younger former first-round pick they can develop for the future. Paajarvi has just seven points (four goals, three assists) in 32 games with the Blues, but he’s proving his worth in other ways while showing flashes of his potential. "What we kind of thought we were getting, we didn’t necessarily get," Blues coach Ken Hitchcock says. "We found a different player. I think we’re getting used to seeing how good he is off the rush. He takes the puck to the net, he makes plays, he’s got great speed, he’s got great timing. I think as a rush-attack player, he’s a lot better than we thought. I think the other part that we thought he was a third-line checker, I think he’s got more in his game. We’re going to have to bring him along and develop it. But I really like the way he is on the rush. He really makes good plays with the puck." Paajarvi had two highlight-worthy plays with the puck recently. He scored a goal in Detroit last week when he corralled a rebound off the boards and banked it in off the backside of goaltender Jimmy Howard with a nifty backhanded wraparound. Then Tuesday, late in the third period against the Devils, Paajarvi used his hand to pass the puck forward to Maxim Lapierre, who scored an empty-net goal on a long backhanded shot. Paajarvi is showing he is more comfortable lately after a slow start to the season that included an injured sternum in late October and took him out of the lineup for a few weeks. "He had a great start, got hurt and had a tough time getting through the injury," Hitchcock says. "He’s back where he first started here, and he’s a very effective player." Paajarvi acknowledges the injury set him back. "Really, I got going there in the beginning and then I got that injury, so obviously, it was tough to come back, but now I feel like I’m on the path again and I feel like I’m getting where I want to," he says. "I think I fit really good in this system, with the two-way game and with the speed-wise on offense and defense. It’s been fun." Paajarvi is averaging a career-low 10:08 of ice time for the season, but he has seen more action of late. He played more than 12 minutes in road wins against the Red Wings and Rangers and played more than 13 minutes in the loss at New Jersey. He averaged a career-high 15:23 in his rookie season in Edmonton while recording 34 points (15 goals, 19 assists). He played more shifts and minutes in his second and third seasons with the Oilers than he is playing now. That, along with learning a new system — which he called the most difficult part of his move to St. Louis — has added to his learning curve with the Blues. He hasn’t had a hard time fitting in with his new teammates, however. "I couldn’t have an easier transition," he says. "We’ve got a couple Swedes on the team and young guys that kind of have the same humor and talk about the same stuff. It’s so easy. This group of guys is special, for sure." David Backes likes what he has seen from his new teammate. "I think he’s getting used to the culture and the work ethic, and he’s got tons of tools in his tool chest to bring a lot to the table," the St. Louis captain says. "He’s a guy that’s not been touted for his strength on the puck or his grind game, but I think that’s in him, and when he uses that in combination with his speed he’s a force for us." Paajarvi is enjoying his time here. It’s certainly been different in St. Louis, where he is contributing to one of the better teams in the NHL after three seasons in which the Oilers were under .500 and finished no better than third in their division. "It’s been good," he says. "We’ve been winning a lot, and I haven’t had that chance to win a lot during the season with Edmonton, unfortunately. So it’s a new thing for me, but it’s really awesome."